The Atmospheric and Oceanic Sciences Department of McGill University operates a UHF wind profiler radar in collaboration with the NOAA Aeronomy Laboratory. Profilers are a class of radar that look vertically up into the atmosphere. It makes high resolution measurements of wind, turbulence, and echo strength in a vertical column above the radar site. Wind measurements are made typically by pointing the radars antenna beam in 3 (or sometimes 5) different directions. (The directions used at McGill are vertical, north at 21° from vertical, and east at 21°). The Doppler shift of the echoes in each direction are compared to determine the wind speed and direction. The scattering targets they receive echoes from depends on the wavelength of the profiler. In the case of UHF band profilers, the targets include rain, snow, and turbulent fluctuations of the clear air. Examples of the Doppler spectra for these targets can be seen on our examples page. The profiler can also occasionally see birds and insects and even smoke plumes. The profiler can also measure temperature using a Radio Acoustic Sounding System (RASS), in which sound waves are emitted and tracked by the radar. The speed of the sound waves is related to air temperature. 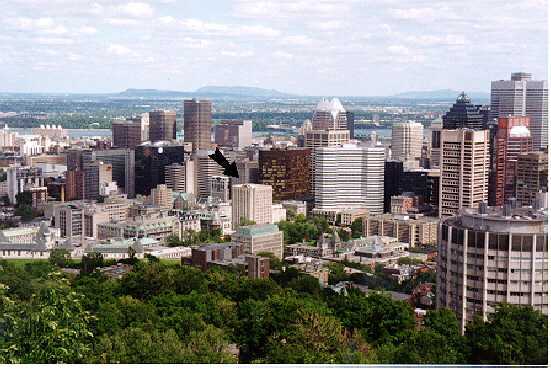 The McGill profiler is located in downtown Montreal city on the roof of Burnside Hall, a 14 storey building nearby to many other taller buildings, and therefore it also gets many echoes from these buildings and aircraft (see Rogers et al). The effective altitude range of the profiler depends on the radar wavelength, as well as factors such as the antenna size, the transmitter power, and the availability of scattering targets. For the McGill profiler, the range in fair weather is typically from about half a kilometre to 2 or 3 km during the summer, although on cold clear winter days sometimes no measurements can be made at all. When it is raining or snowing, measurements can be made from as low as 100 metres, and often up to 6 km altitude or higher. The region of the atmosphere in which profilers like the McGill profiler make most of their measurements is known as the boundary layer, hence these profilers are often called boundary layer profilers. Other profilers are designed to make measurements higher in the atmosphere (for example MST radars probe the mesosphere, stratosphere, and troposphere). The McGill profiler operates continuously, providing wind measurements approximately every 5 minutes. Control and data processing and archiving (on optical disk) is carried out by a PC. The PC also passes spectral moment information in real-time to workstations where analyses are made and the on-line data plots (see above) are produced. Hourly summary data is passed in near real-time to the NOAA's Profiler Control Center for inclusion in their National Climatic Data Center (NCDC) archives and to the NWS. The profiler was designed by NOAA (see Ecklund et al) and built by the Radian Corporation. Immediately adjacent to the profiler are four special speakers that are part of the Radio Acoustic Sounding System (RASS) addition to the profiler. The speakers broadcast sounds around 2000 Hz in the vertical. When the frequency of the sound is such that the sound waves are separated by a distance of half the wavelength of the profiler (32.8 cm ÷ 2 = 16.4 cm), the profiler can detect the sound waves. From this information, the speed of the sound waves can be measured with height. Since the speed of sound is related to temperature, temperature profiles can be obtained. At McGill, the RASS system is operated a few minutes every hour. Typically, profiles of temperature can be obtained only in the first kilometer of the atmosphere. Beyond that distance, the wind pushes the sound waves away from the region sampled by the profiler and turbulence destroys the fairly high frequency sound. The RASS system is used primarily for research. Ecklund, W.L., D.A. Carter, & B.B. Balsley, "A UHF wind profiler for the boundary layer: brief description and initial results", J. Atmos.Oceanic.Tech., 5, 432-441, 1988. Rogers, R.R., S.A. Cohn, W.L. Ecklund, J.S. Wilson, and D.A. Carter, "Experience from one year of operating a boundary-layer profiler in the center of a large city", Ann. Geophysicae, 12, 529-540, 1994. Profilers are also discussed in : Doviak R.J. & D.S. Zrnic, "Doppler radar and weather observations", 2nd ed., Academic Press, 1993.